Spendor expands A-Line speaker range with new A7 | What Hi-Fi? 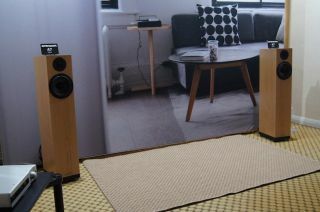 The British speaker brand has added a third floorstander to its most affordable line of speakers. Following the What Hi-Fi? Award-winning success of the A4 pair, Spendor has launched a new model for its A-line range, the A7, which was shown off at the Bristol Show. Spendor’s most affordable range (launched last year) is now four-strong, comprising one standmounter (A1) and three floorstanders (A2, A4 and A7). The A7s benefit from technology developed for the high-specified SA1, A6R and D7 speakers, but also feature new EP77 Polymer cones. A first look at the Bristol Show confirmed their stature is in line with the slim, compact physicality of the rest of the range, but they are a few centimeters larger than their A4 siblings. The Spendor A7s are available in black ash, natural oak and dark walnut finishes, priced £2995, with grilles an optional extra.